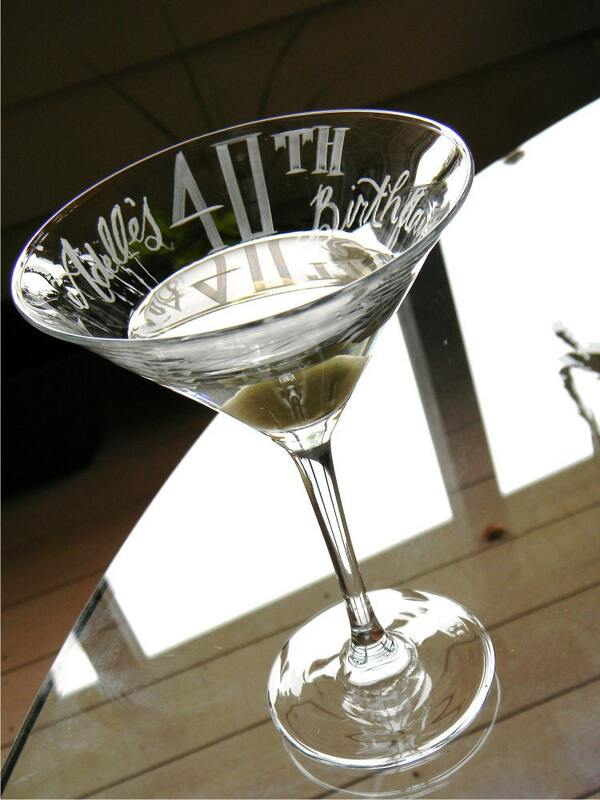 Celebrate any year or any occasion with a personalized martini glass for the guest of honor! This fun martini glass is has an elegance about it with its slender stem, clear sheer glass and looks great engraved. Makes a great gift for your bff, girl or guy friend. Engraving Included: Name with leaf wrap design, Birthday/Anniversary/Any Congrats message in script lettering with year in larger block as shown on sample pic and date on base (optional). This glassware is hand crafted using an old world techniques of engraving called stone wheel engraving. Stone wheel engraving is an age old art form of glass engraving that is not commonly practiced in the world today. With newer technologies such as laser engraving, sandblasting, acid etching and machine engraving, stone wheel engraving has become a dying art. As a stone wheel engraver I spend time shaping my wheel using diamond and stone dressing tools to create different effects on glass. Some I create for a smooth surface, some thick and some thin depending on what lettering and designs I’m engraving. The carbundum wheels that I cut into the glass with are driven with a belt on a lathe that carries a range of interchangeable spindles. I mount each stone wheel onto these spindles prior to dressing them. As I engrave onto the glassware I make cuts into the glass working by hand both upside down and backwards. I sometimes draw guidelines onto the glass however no stencils or templates are used. There will be variations in the lettering, spacing and designs of stone wheel engraving, this is the beauty and character of the art and the one-of-a kind original piece of customized glassware. Great craftsmanship and a quality glass. fast shipping, very good quality! well done! beautiful! I reordered this product because I was so happy with the last order and I was not disappointed!! She did a great job in great timing! !